This variant evolved from the idea of creating a double-chess (32 pieces a side and a board of 128 squares); not a new idea, but while I did not want an overly oblong board, I did want pieces that moved in familiar FIDE fashion, though perhaps with non-FIDE combinations.Â This variant is probably my closest to FIDE chess.Â More details behind the genesis of this variation are given in the Notes. The starting array is shown in the next image below, taken from my game courier implementation. The board consists of 132 squares (11x12) and each player has 33 pieces occupying three rows. The piece types are those found inÂ standard FIDE plus each FIDE type augmented by combining with the FIDE knight. Thus each side, at the start of the game has 33 pieces. 1 King As the FIDE King. Â Â Â Â Â the King Â moves to the c-file and the Rook moves to the d-file. Â Â Â Â Â the King Â moves to the i-file and the Rook moves to the h-file. 2 Queens As the FIDE Queen. 4 Bishops As the FIDE Bishop. 4 Knights As the FIDE Knight. 2 Horseguards May move like a King (one step in any direction) or may move like a Knight. 2 Archbishops May move as either Bishop or Knight. 2 Marshalls May move as either Rook or Knight. 1 General May move as either Queen or Knight. 11 Pawns As FIDE Pawns. Pawns may take a double-step on their first move. Pawn's promote on reaching the furthest rank. Rules are as for FIDE chess apart from the larger board, the increased number of piece-types, and the increased number of pieces at the start. Since I was doubling (plus some)Â the board size it seemed appropriate to double the number of pieces.Â Increasing the number of pieces by the same proportion as the squaresÂ yielded 33 pieces a side - which nicely fitted into 3 ranks on the 11x12 board.Â Doubling the number of each FIDE piece, except the King (left at 1 per side) and Pawns (only 11 needed to fill a rank) gave 26 pieces - leaving 7 to find. Combining the knight's move with Rook, Bishop, and KingÂ gave 6 pieces (2 each of Horseguard,Â Archbishop, and Marshall).Â The final piece, the General, combined the knight's move with a Queen. 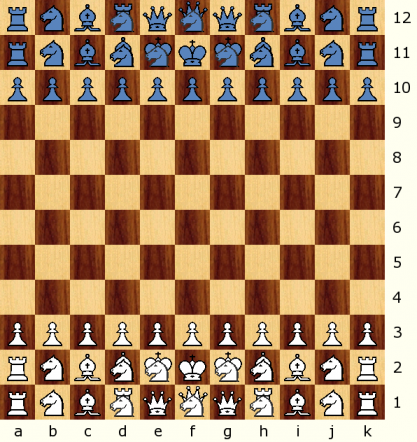 I'm never too certain about piece values, but feel that on the larger board the knight will drop in value as compared to the rook and bishop.Â As a tentative first guess the relative values are: Pawn 1, Knight 3, Bishop 4, Horseguard 5,Â Rook 6, Archbishop 7, Marshall 9, Queen 10, General 12. The name Panchimera roughly translates to "All the conjoined creatures" and is a reference to the fact that this variant uses pieces that combine the Knight with each of the other piece types. This subvariant uses a 10x10 board and is very closely related to Charles Gilman's Ã‰checs De L'Escalier (see comments). The main point of difference is my inclusion of the Knight+King(Man) compound. I have designed this variant as 10x10 boards are easier to obtain than 11x12 boards, and I wanted to be able to play Panchimera for real and not just virtually. The starting array is shown in this next image. Â Â Â Â Â the King Â moves to the h-file and the Rook moves to the g-file. Click on the above link to view logs of Panchimera played on Game Courier. Yes, Charles, castling is only allowed with Rooks on the same rank. And the comparison with your variants is certainly interesting - particularly so with my newly added 10x10 subvariant. I assume that Castling is possible only with the Rooks on the same rank as the King. This variant contrasts interestingly with two of mine. Nearlydouble Chess doubles the number of all pieces except the King, and likewise doubles the size of the board and rounds down to an 11x11 board. As both pieces and squares are rounded down and Pawns are included in the doubling I find no need for extra piece types - although I do enhance the Knights for the larger board. I didn't go for a triple-step Pawn move either - but I did go for a much-enhanced double one. Castling with the outer Rook is the same as in this game, but there is also Castling with inner Rooks, as all Rooks start on the same rank as the King. Piece density is 51.24%. 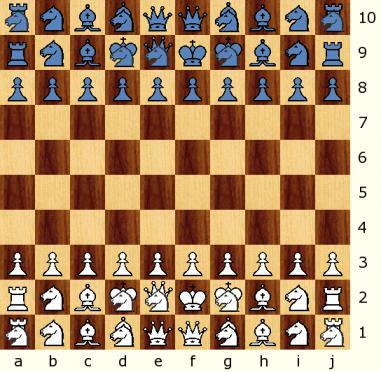 Ã‰checs De L'Escalier has twice the symmetric pieces of the Carrera/Bird/Capablanca family, with a Queen+Knight compound substituted for the second King aside, but no increase in those variants' Pawns, and the increase in army size by a half relative to those armies is accompanied by enlarging the board only to 10x10 - not much over half as much again as the FIDE board. Pawns I judged close enough to each other to need only the standard double-step initial Pawn move. To cope with Rooks on two ranks, Castling is of the Ecumenical variety, allowing King and Rook alike to move within a 2x2 area beforehand. Piece density is 60%. Zillions develops Knights and Archbishops first, eventually moving Pawns to attack encroaching enemy pieces. Hopefully my Zillions file will be posted here soon.